The Spartan South Midlands League is a three-division league at Steps 5, 6 and 7 in the National League system, feeding the Isthmian League and the Southern League. 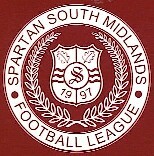 The league was formed in 1997 as a merger of the Spartan League and the South Midlands League. The league has a website, full of current league information at http://www.ssmfl.org while, league results and tables since 2000-01 can be found via Football Mitoo. The F.C.H.D. has the complete final table information for this league compiled from contemporary sources. We're not aware of the full set of tables being published in book form.